What is the cheapest way to get from Chappaqua to White Plains Airport (HPN)? The cheapest way to get from Chappaqua to White Plains Airport (HPN) is to drive which costs $1 - $2 and takes 12m. What is the fastest way to get from Chappaqua to White Plains Airport (HPN)? The quickest way to get from Chappaqua to White Plains Airport (HPN) is to taxi which costs $22 - $27 and takes 12m. How far is it from Chappaqua to White Plains Airport (HPN)? The distance between Chappaqua and White Plains Airport (HPN) is 7 miles. The road distance is 7.6 miles. 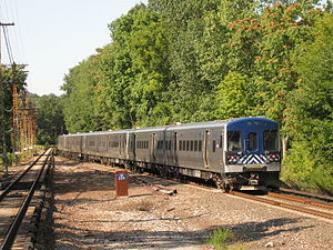 How do I travel from Chappaqua to White Plains Airport (HPN) without a car? The best way to get from Chappaqua to White Plains Airport (HPN) without a car is to train and line 12 bus which takes 2h and costs $7 - $17. How long does it take to get from Chappaqua to White Plains Airport (HPN)? It takes approximately 2h to get from Chappaqua to White Plains Airport (HPN), including transfers. Can I drive from Chappaqua to White Plains Airport (HPN)? Yes, the driving distance between Chappaqua to White Plains Airport (HPN) is 8 miles. It takes approximately 12m to drive from Chappaqua to White Plains Airport (HPN). Where can I stay near White Plains Airport (HPN)? There are 82+ hotels available in White Plains Airport (HPN). Prices start at $93 USD per night. What companies run services between Chappaqua, NY, USA and White Plains Airport (HPN), USA? There is no direct connection from Chappaqua to White Plains Airport (HPN). However, you can take the train to White Plains, take the walk to White Plains Bus Terminal Lane B, then take the line 12 bus to Westchester County Airport Terminal. Alternatively, you can take the taxi to White Plains Airport (HPN). Rome2rio's Travel Guide series provide vital information for the global traveller. Read our range of informative guides on popular transport routes and companies - including How to travel India's Golden Triangle, Thanksgiving 2018: How to travel stress-free and The beginner’s guide to the 2018 World Nomad Games - to help you get the most out of your next trip. Discover how to get to attractions and hotels near Purchase. Kykuit, known also as the John D. Rockefeller Estate, is a 40-room National Trust house in Westchester County, New York, built by order of oil tycoon, capitalist and Rockefeller family patriarch John D. Rockefeller. Conceived largely by his son, John D. Rockefeller, Jr., and enriched by the art collection of third-generation scion, Governor of New York and Vice President of the United States, Nelson Rockefeller, it has been home to four generations of the family. Sleepy Hollow Cemetery in Sleepy Hollow, New York, is the final resting place of numerous famous figures, including Washington Irving, whose story "The Legend of Sleepy Hollow" is set in the adjacent Old Dutch Burying Ground. Incorporated in 1849 as Tarrytown Cemetery, it posthumously honored Irving's request that it change its name to Sleepy Hollow Cemetery. It was listed on the National Register of Historic Places in 2009. The Glass House or Johnson house, is a historic house museum on Ponus Ridge Road in New Canaan, Connecticut. Built in 1949, it was designed by Philip Johnson as his own residence, and "universally viewed as having been derived from" the Farnsworth House design, according to Alice T. Friedman. Johnson curated an exhibit of Mies van der Rohe work at the Museum of Modern Art in 1947, featuring a model of the glass Farnsworth House. It was an important and influential project for Johnson and for modern architecture. The building is an essay in minimal structure, geometry, proportion, and the effects of transparency and reflection. The estate includes other buildings designed by Johnson that span his career. It was designated a National Historic Landmark in 1997. It is now owned by the National Trust for Historic Preservation, and is open to the public for guided tours, which begin at a visitors center at 199 Elm Street in New Canaan. The Donald M. Kendall Sculpture Gardens is a collection of 45 pieces of outdoor sculpture at the PepsiCo world headquarters in Purchase, New York. The collection includes work from major modern sculptors including Auguste Rodin, Henry Moore, Alexander Calder and Alberto Giacometti. Rome2rio makes travelling from Chappaqua to White Plains Airport (HPN) easy. Rome2rio is a door-to-door travel information and booking engine, helping you get to and from any location in the world. Find all the transport options for your trip from Chappaqua to White Plains Airport (HPN) right here. Rome2rio displays up to date schedules, route maps, journey times and estimated fares from relevant transport operators, ensuring you can make an informed decision about which option will suit you best. Rome2rio also offers online bookings for selected operators, making reservations easy and straightforward.